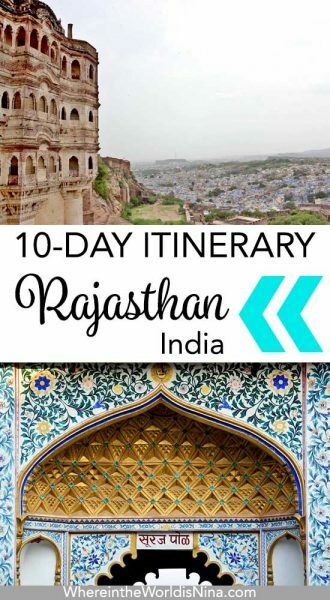 A 10-Day Rajasthan Itinerary To Jaisalmer, Jodhpur & Udaipur (India) | Where in the World is Nina? 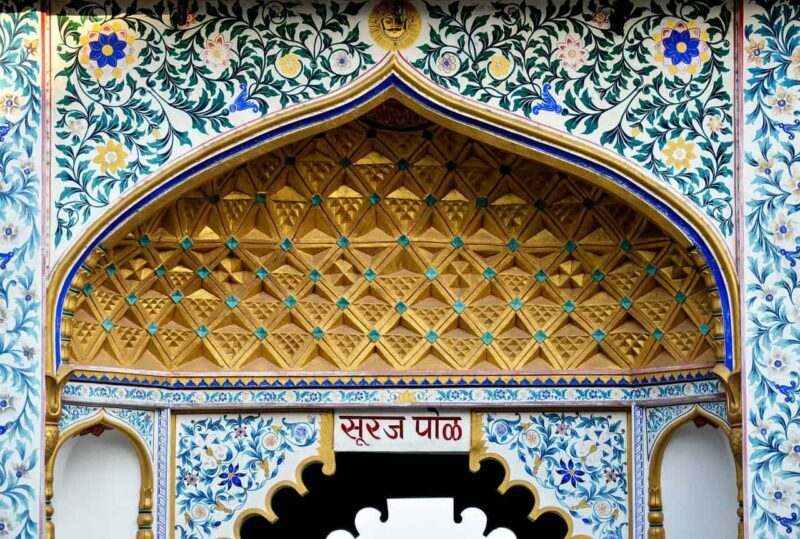 This Rajasthan itinerary is a guest post from Shweta. For a first-time visitor to India, there’s nothing better than a Rajasthan trip to immerse yourself in the beauty, colour, architecture, hospitality, and chaos of my country. 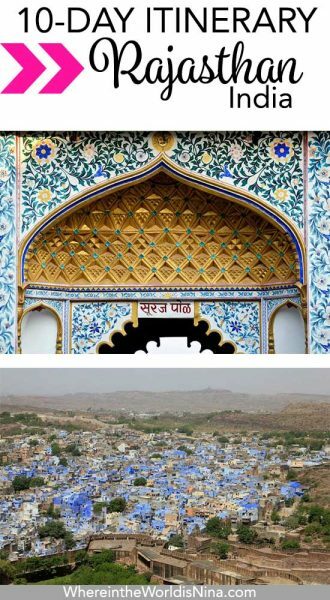 Let me jump right in with a detailed Rajasthan itinerary for 10 days, that covers 3 beautiful and historic cities. If you are an international visitor, chances are high that you would be first landing in either Delhi or Mumbai. You should plan to visit the lovely cities of Udaipur, Jodhpur, and Jaisalmer. Either fly into Jaisalmer from Delhi or Mumbai and then move on to Jodhpur and further to Udaipur, or you can do this itinerary in reverse. The Golden City gets its name because the Jaisalmer Fort and several other structures are made of warm, yellow sandstone. Jaisalmer lies on the western border of Rajasthan. Plan to spend a day or two to explore Jaisalmer city and then another night to experience the Thar Desert. A must-visit site is the fabulous Jaisalmer Fort that towers over the small city. There are about 3000 people residing within this massive sandcastle. We hired a guide to show us around one of the largest inhabited forts in India. A manmade reservoir, the Gadisar Lake in Jaisalmer. There are many beautiful Havelis (old merchant houses) with intricate stonework in the old town. You could spend a leisurely day exploring the sites within the old town and doing some shopping of local artifacts – colourful Rajasthani outfits, puppets, kitschy bags, bangles and more. 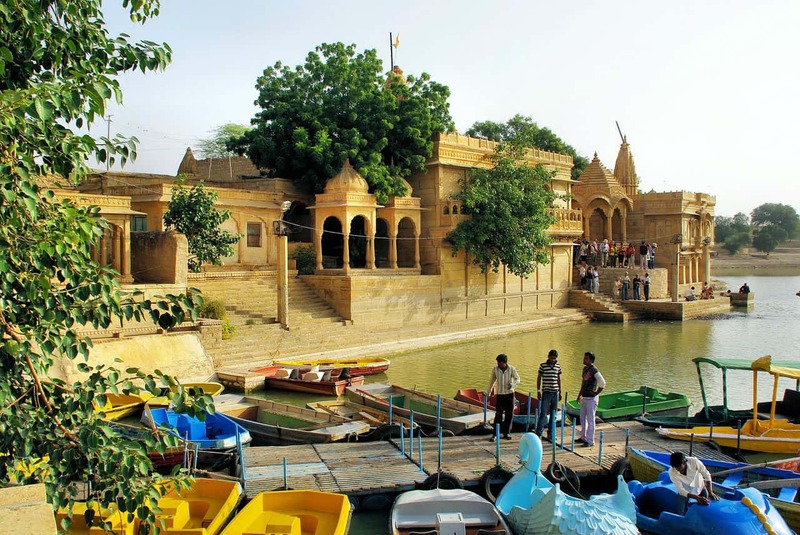 Spend the next day visiting a few sites outside Jaisalmer city. There is Bada Bagh, The Royal cenotaphs and the best time to visit is just before sunset. Gadisar Lake is a beautiful site to visit. This is one of the few surviving heritage lakes in Rajasthan. If you’re low on time or don’t want to sort things out yourself, here is a popular Jaisalmer tour involving a city trip and camel ride! On your Rajasthan trip never forget to include camel safari tour in the Thar desert. Get a chance to enjoy the scenic views both day and night of the Thar Desert. 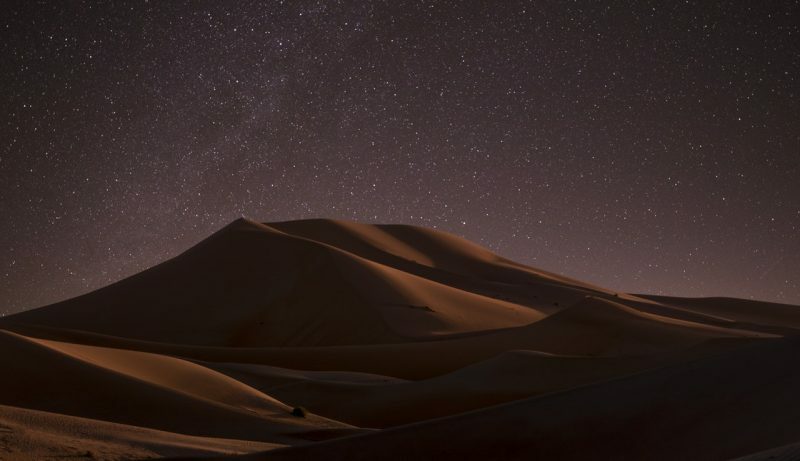 Besides the sightseeing in and around Jaisalmer, a must-do activity is to spend a night in the Thar desert to make most of your Rajasthan itinerary. I assure you that the time you spend on the dunes will be unforgettable. You could take a flight to Jodhpur, or even choose to travel by road —the road trip would take at least 5 hours. This is one of my favourite cities in Rajasthan. Jodhpur —with the majestic Mehrangarh Fort, spicy local food, and friendly vibes —is a must-do on any Rajasthan itinerary. 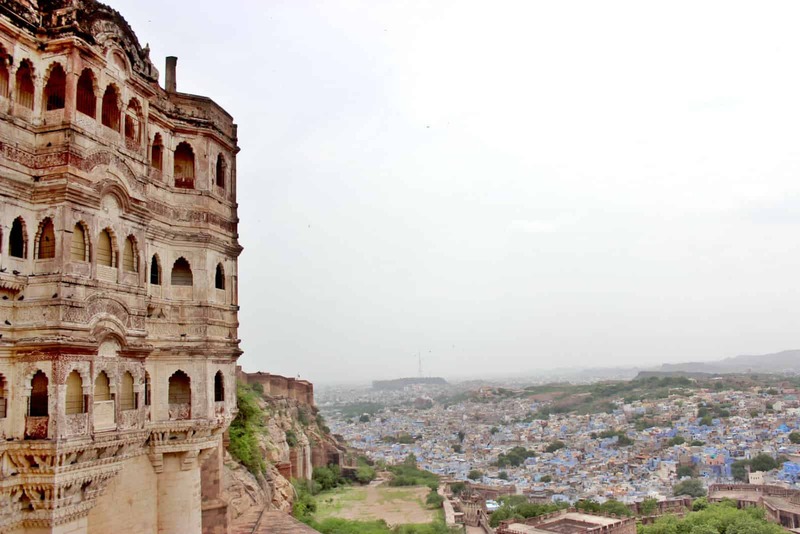 Plan to spend at least 2-3 days in Jodhpur. Even though Rajasthan is full of awesome forts and palaces, in my opinion, there is none as majestic as Mehrangarh Fort. This massive structure, standing at 410 feet looms large and can be seen from practically anywhere in the old city of Jodhpur. Do visit the well-stocked museum inside the fort as well. Do wear sensible shoes while visiting the Fort – it is a steep walk from the main entrance to the interiors. Jaswant Thada, a marble memorial, is located about a kilometer away from Mehrangarh. 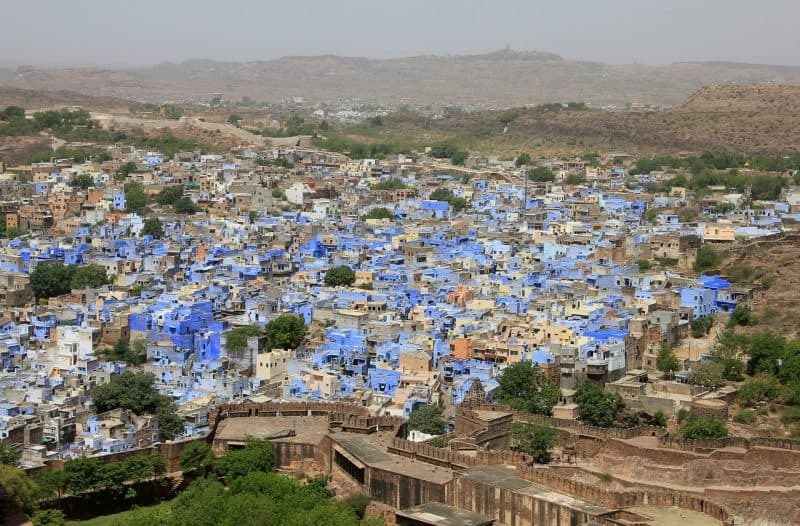 The blue city Jodhpur view from the mighty Mehrangarh Fort is a must-see on your Rajasthan itinerary. A day would be spent visiting the Mehrangarh Fort and museum and Jaswant Thada, and unwinding with a lavish dinner in the evening. You could do some more sightseeing and local shopping the next day. Clock Tower is an old city landmark surrounded by the vibrant sounds, sights, and smells of Sardar Market. Except for Sundays, the crowds can be quite chaotic here. If for any reason, you have missed out on the desert experience in Jaisalmer, a visit or even an overnight stay in a desert camp can be done from Jodhpur. To get the most of Jodhpur without much time, here are the best tours in the area from reputable companies. This “Blue City” is a mesmerizing collection of azure abodes that delight anyone. The tag of ‘the most romantic spot on the continent of India’ sits well on Udaipur. This is a city of romance and luxury, of old-world charms and hospitality that will take your breath away. For the best Udaipur itinerary, I’d suggest 2-3 days to soak in the atmosphere. Udaipur —the City of Lakes and Palaces—is one of the top destinations in Rajasthan for the discerning traveler. The City Palace & Museum is the largest palace in Rajasthan and a must-visit on your Udaipur visit. Again, wear sensible shoes. The Palace is built on several levels, and the old-construction stairs are steep, especially for kids. Thanks to the foresight of the city’s founder, Udaipur is one of the greenest cities in Rajasthan. Taking a boat ride on Lake Pichola, with the view of the City Palace on one side and Jagniwas island (now Taj Lake Palace) on the other. Sunset excursions are quite popular. The Vintage Car Museum has a car collection belonging to the royal family, that is worth a visit. If you are not completely exhausted with forts and palaces by now, I can suggest a few other sites in Udaipur for you if you’re up for it. 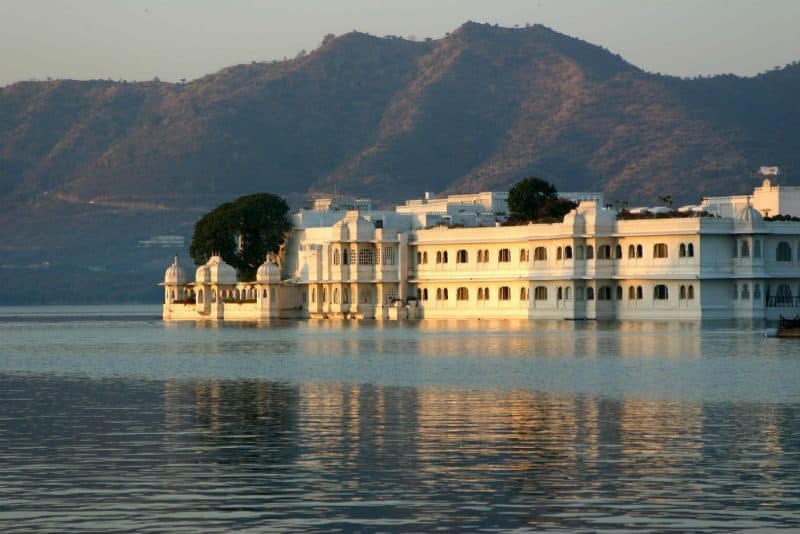 The Palace on Jagmandir Island which the royal family used as its summer resort and for hosting parties as well as the Monsoon Palace, a 19th-century palace is located just outside Udaipur which offers panoramic views of the city and the area around it—are both worth visiting. 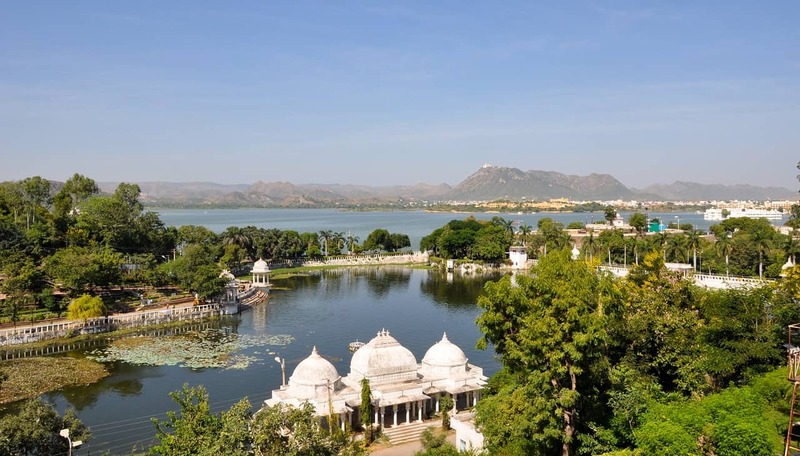 Try out some of these reputable Udaipur tours to save some time and planning. Udaipur Pichola Lake is one of the most beautiful and picturesque lakes you’ll see on your Rajasthan itinerary. Drink bottled water to stay safe from stomach upsets. But do try the local Rajasthani cuisine. The local shops serve spicy fare especially in Jodhpur, but your hotel would reduce the spice level at your request. The sun is strong even in winters, so use a good sunscreen and stay hydrated. Also, wear appropriate clothing and be respectful of local culture, especially if you are visiting temples and other religious sites. In general, touts are a lesser nuisance in Rajasthan than other parts of North India. Hopefully, a firm no sends the message across. Taking a local guide will help you understand the history a bit better, especially if there are no audio tours available. Also memorable to experience as part of your Rajasthan itinerary is a stay at a heritage property (an erstwhile fort or palace converted to a hotel) for deeper immersion in the culture or some uber-luxury property, if budget is not a concern. Rajasthan does luxury hospitality well. What are your thoughts on this Rajasthan itinerary? Are you excited? Let me know in the comments below! Shweta runs her own travelogue at zestinatote.com. Her focus is on Family & Luxury Travel – destinations, luxury stays, tips on family travel. You can follow her by checking out her Facebook and Instagram. Don’t lose this! Click the pic to pin it for later.